When an accident happens, victims are often unsure of where to turn for help. Many choose to hire an attorney to assist them with collecting compensation for damages. This raises the question of how accident victims choose their attorneys, and the answer for many is advertising. The Norfolk Personal Injury Lawyers with Lowell “The Hammer” Stanley recently got a nod for their advertising style in a recent podcast. In fact, the hosts of the series declared some of the firm’s ads worth of placement in the legal advertising record books. 99% Invisible’s host, Roman Mars, talked about Stanley’s use of flaming cars and explosions in his ads as a practice once prohibited by the American Bar Association. That restriction was lifted by a Supreme Court ruling stating that lawyers have the same rights to free speech as anyone else. 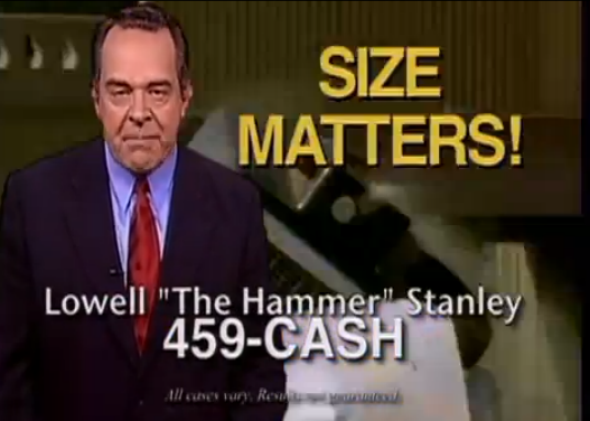 Lowell “The Hammer” Stanley and his team of attorneys are proud to take their place in legal advertising history books, and they encourage the public to stay aware of our media appearances by checking our Legal & Firm News.